Swapnomoy Chakrabarty is basically earned reputation in Bangla literature as a short story writer. But He has also reputation as well as writing novels, articles and columns. The first story of this eminent author was published in the 'Amrita' magazine in 1972. He received Ananda Award in 2015 for his experimental novel "Holde Golap'. This novel is a researched novel with people of the third gender. Swapnomoy got Bankim Award for the novel 'Abantinagar' in 2005 and he has also been honored with Manik Bandyopadhyay Award, sarba Bharatiya Kotha Puruskar etc. Some of his memorable creations are- 'Bhumisutra', 'Astacharan Sholo Hatu', 'Phul Chhoyano', 'Bheja Barud', 'Duniadari', 'Porobasi', 'Jarsi Garur Ulto Bachchha' etc. 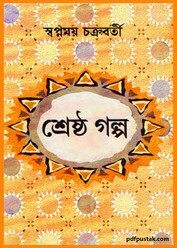 Now I want to share- 'Shrestha Galpa' selected best stories by Swapnomoy Chakrabarty. There are thirty selected stories in this book, like as 'Astacharan Sholo Hatu', 'Rakta', Shani', 'Patakar Kapar', 'Jhare Kak More', 'Dudhoyala', 'Ichchhehusum', 'Kyarakkas', 'Hanuman', Lajjamuthi' etc.